Today I'm featuring an upcoming read, Booked 4 Murder by J.C. Eaton. The excerpts shared are from a library copy. "I'm telling you, Phee, they were all murdered. Murdered by reading that book." Page 56: "They all shook their heads. What followed would have made Agatha Christie shudder." My thoughts: This cozy series is the work of two authors, Ann I. Goldfarb and James E. Clapp, writing as J.C. Eaton. What attracted me to this particular book is the title and its cast of characters, which includes a book club. Book 2 in the Sophie Kimball Mystery Series—Ditched 4 Murder—was released last month (November 2017), and book 3, Staged 4 Murder will be published on June 26, 2018. Look for another series from this duo next year, with the publication in March 2018 of A Riesling to Die, the first book in the Wine Trail Mysteries. Cozy mysteries featuring books and wine—does it get any better than that? 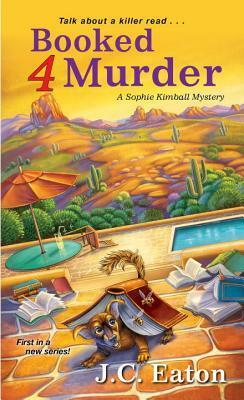 From Goodreads: Sophie "Phee" Kimball is not a cop. She's a divorced, middle-aged mom who works as an account clerk for the police department in a small city in Minnesota. But her retired mother, Harriet Plunkett, is convinced Phee is the only one who can solve the mystery of a cursed book. According to Harriet, four members of her book club have already succumbed to the deadly curse. Harriet insists Phee catch the next plane to her retirement community in Sun City West, Arizona, to investigate.